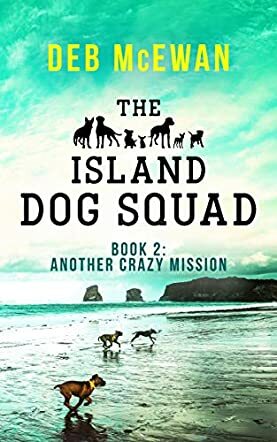 The Island Dog Squad: Book 2: Another Crazy Mission is an animal adventure novel for preteens and young adults written by Deb McEwan. Life for Sandy and her Dog Squad friends, Lola, Obie and Chip, was pretty idyllic, especially after the struggles they had endured dealing with the Crazies as detailed in the first book in the series, Sandy’s Story. Sandy hadn’t seen her friends for about a week since their human companions had been busy with their working lives, and the unseasonably heavy rains had left them little opportunity to see each other on walks. When Ellie did find the time, and a break in the rain permitted, she and Sandy went out for a brief walk. When Gina, Obie and Lola’s human companion, pulled up in her car to speak with Ellie, Sandy was stunned to see only Obie in the back seat, and he was acting as though he didn’t even see her standing there. What had happened, and where was Lola? Deb McEwan’s The Island Dog Squad is a fast-paced and fun story that continues the saga of the Island Dog Squad. While this is the second book in the series, McEwan gives enough background information for it to be read on its own, but I would advise reading the books in order to get the full impact of the stories and the relationships between the dogs and their human companions. The plot is well crafted and exciting, and the characters continue to get more dimension and are a hoot to follow as they hatch a wild plan to rid the island of a dangerous foe. The Island Dog Squad: Book 2: Another Crazy Mission is most highly recommended.